The quiet slumber of the Subra al-Kheima neighborhood would soon come to life, a short distance from the banks of the Nile River. On August 20, 2015, a motorbike followed the car bomb towards its target, just north of downtown Cairo inside the Ring Road. The driver of the car bomb pulled the vehicle in front of the State Security Building and exited quickly. Jumping onto the back of the motorbike the two terrorists sped away. Within moments the neighborhood was jolted awake when the car bomb detonated destroying buildings and injuring 11 police officers and soldiers. This attack was clearly the work of terrorists from the ISIS affiliate Ansar Bayt al-Maqdis/Wilayat Sinai. A claim of responsibility followed from the Islamic State Egypt, announcing that this attack was carried out in retribution for the execution of six men convicted of killing a number of military in a raid in Sharkas. In November 2014, Ansar Bayt al-Maqdis pledged bayat (loyalty) to Abu Bakr al-Baghdadi. Soon after Abu Bakr al-Baghdadi released an audio tape announcing several new provinces of ISIS’ Caliphate to include the Sinai. Leaders of Ansar Bayt al-Maqdis had previously pledged bayat (loyalty) to Abu Bakr al-Baghdadi seeking to join ISIS and would now be known as the Wilayat Sinai (Sinai Province). ISIS gets the propaganda of extending its reach into Egypt while Ansar Bayt al-Maqdis (ABM) gets resources and foreign fighters. The group has conducted numerous attacks on buses to include a complex attack in Eilat, Israel in 2011. ABM terrorists have conducted numerous attacks on police and military buses as well as a suicide bombing on a bus carrying Korean tourists. The main efforts of these terrorists have been to attack elements of the Egyptian government to include numerous assassination plots on government officials. They have also attacked an Egyptian helicopter and a navy ship. We will continue to see these types of attacks being conducted by this terrorist group. On August 6, 2014, ABM terrorists killed William Henderson, the District Manager of the Karama Field in the Western Desert. The terrorists twitted “we claim responsibility for the killing of American oil expert in the Western Desert.” They attached photos of Henderson’s passport and his Apache company identification cards. While the limited media that reported on this stated it was an attempted carjacking this shows that ABM/Sinai Province is expanding its reach in Egypt. Often thought of as that “terrorists group in the Sinai” we have seen numerous terrorist attacks outside its stronghold of the Sinai to include attacks in Cairo, southern and western Egypt. 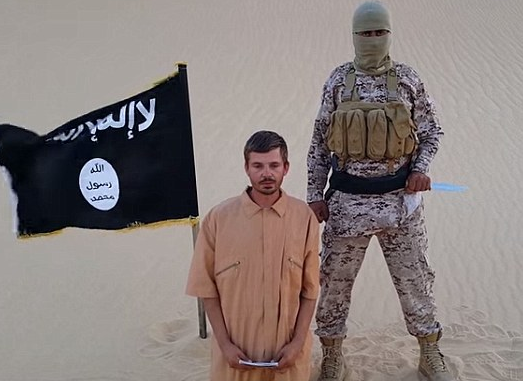 On the morning of August 12, 2015, ISIS released photos showing the beheaded body of Salopek. Salopek left behind a wife and two children. ISIS is a global problem and Egypt and the region are feeling the pain associated with the activities of this terrorist group. No one is immune. After the much publicized beheadings of 20 Egyptian workers on February 15, 2015, thousands of Egyptians working in Libya returned home. Most of these men went to Libya for jobs and sent monies back home. Westerners working in Egypt will likely do the same thing if this situation isn’t remedied quickly. In Cairo this week, it was announced that all businesses seeking to obtain commercial licenses would be required to install security surveillance cameras before being granted a license. This will assist in identifying not only an attack like the attack on the National Security building but possibly the casing and surveillance of targets. But Egypt will have to do more to stem the growth of this terrorist epidemic. Just this last week ABM terrorists stopped a bus traveling from Rafah to al-Arish and seized four HAMAS members. The four Palestinians, Abdul-Dayem Abdul-Baset Abdul-Dayem, Abdullah Said Abu Jbein, Yasser Fathi Zannoun and Hussein Khamis ath-Thabda are all being held to pressure HAMAS in Gaza to release 50 Salafists being held by HAMAS. HAMAS has recently cracked down on Salafists and ISIS supporters in Gaza. ABM has issued a demand and are threatening to kill the four HAMAS members if their demands are not met. Egypt has numerous problems besides terrorism. High unemployment, lack of housing, congrestion and a stagnant economy are but a few. Tourism, fees from the Suez Canal and oil/natural gas are all huge contributors to the Egyptian economy. But terrorism threatens all three segments. Abdel Fattah al-Sisi wants to build a “new shining city of Cairo” to solve the congestion of Cairo and bring in economic investment. But before anyone will want to invest or tour Egypt, or work there, the terrorists of Ansar Bayt al-Maqdis/Wilayat Sinai must be dealt with. While ABM terrorists have aligned themselves with ISIS, the terrorists in the Sinai and Cairo are Egyptians. Until Egypt deals with this problem there can be no shining new Cairo on any hill. The longer the problem festers the larger it will become.